This week on the blog, I thought I would share something a little different. I interviewed the builder who created our Make It Your Family Farmhouse, Upcycled Trestle Table. And the builder just so happens to be my dad. What was the first piece of furniture you built? When was that? I built a bench and a toybox in 4H. I was about 10 or 11 years old at the time. Did you create the pieces from scratch, or how did you know what to do? There was a 4H planbook that had pictures, told you the materials you needed, instructions to follow, what lengths to cut boards, etc. What was the next thing you built? I helped build the hay barn (on the family farm) when I was 20. Yeah. I mean I didn’t do it on my own or anything. I helped my pop build it. It took us a couple months. I know you make drawings beforehand. Tell me a little bit about your design process. Where do you pull inspiration from? Tell me about where the wood from this table is from. The wood is all out of the house. (The house is farmhouse my father grew up in, located in Kansas.) The wood is mostly fir, maybe some pine. It is the wood that was the floor joists, as well as studs out of the wall. I call it structure wood. What is one of your favorite memories of growing up on the farm? I loved the freedom. Back then, there wasn’t so much fear of bad things happening to children, like them being kidnapped. We worked a lot, but we also had free time to go fishing, wander around, and just explore. 300 acres is a pretty good area to go exploring in. How did you come up with the color for the stain? I used a pre-stain sealer that turned the wood a reddish color. Then I applied ash-colored stain to return the aged look to the wood. Then I sealed the table with several layers of polyurethane. What is your favorite part of making a table? What is one thing you have learned from making these tables? I like to work with repurposed wood because it doesn’t have to be perfect. Yeah. I think that is what makes these tables so beautiful. The imperfections make the tables completely unique. The older I become, the more I appreciate imperfection in home design. Let’s be real. Your house is never going to look like the cover of Architectural Digest or even HGTV Magazine most days. You live there, you have kids, you have pets. Dirt gets on the rug. Wine gets spilled. (In my house, far too often.) Dust settles EVERYWHERE. So rather than worrying about all the ways my house doesn’t look like an magazine cover, I decided to embrace imperfection. 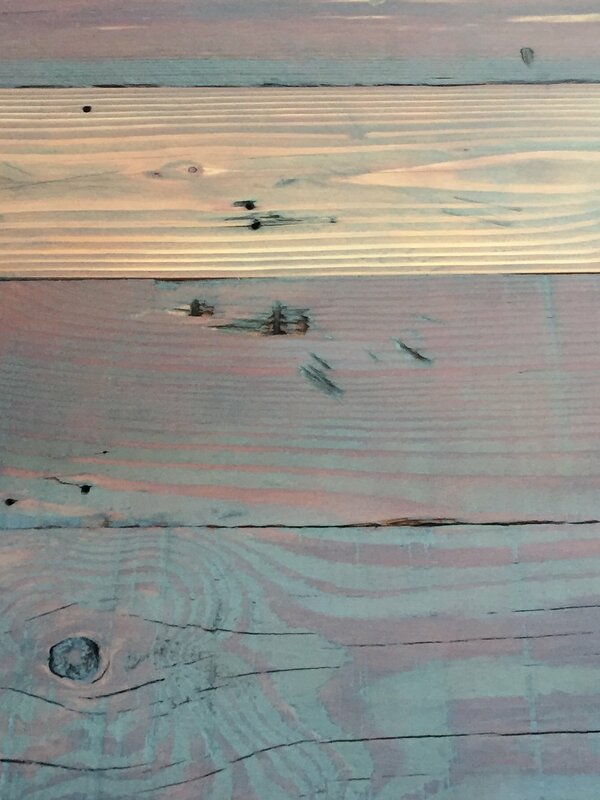 Seek out something with a little patina, a little chipped paint, or a few scuff marks. It shows the piece has age and character. And then when I spill wine (or paint) on that old trunk I use for a coffee table, I don’t worry. I am just adding to the charm. And the less things I have to worry about, the better.